I love brownies. (Really, who doesn’t?) So I figured what better way to break in my new cookbook than with brownies. Unlike other recipes I’ve tried, this one isn’t a one bowl deal, but it’s still pretty easy. And, since I’m a big fan of the cake-like brownie, I heeded the suggestion and added 1/2 tsp. baking powder to make them less dense and more cakey. 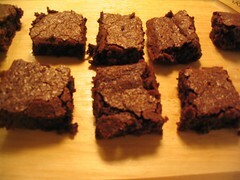 They’re quite good–moist and chocolatey, but not the brownie recipe I’ve been searching for. Preheat the oven to 350F. Grease an 8-inch square baking pan, or line it with aluminum foil and grease the foil. Combine the chocolate and butter in a small saucepan over very low heat, stirring occasionally. When the chocolate is just about melted, remove from the heat and continue to stir until the mixture is smooth. Transfer the mixture to a bowl and stir in the sugar. Then beat in the eggs, one at a time. Gently stir in the flour, salt, and vanilla. Pour and scrape into the prepared pan and bake 20 to 25 minutes, or until just barely set in the middle. It’s better to underbake brownies than to overbake them. Cool on a rack before cutting. Store, covered and at room temperature, for no more than a day. Cookbook Notes: If you line the baking pan with lightly greased aluminum foil, you reduce cleanup time by fifty percent; not bad. These are chewy and dense, dominated by chocolate and nothing else. If you like cakier brownies, add one-half teaspoon baking powder to the flour. I used both of his suggestions. Recipe from How to Cook Everything by Mark Bittman. I agree, you can never go wrong with brownies. These look and sound delicious. I always prefer the brownies that use real chocolate in them. Well done!